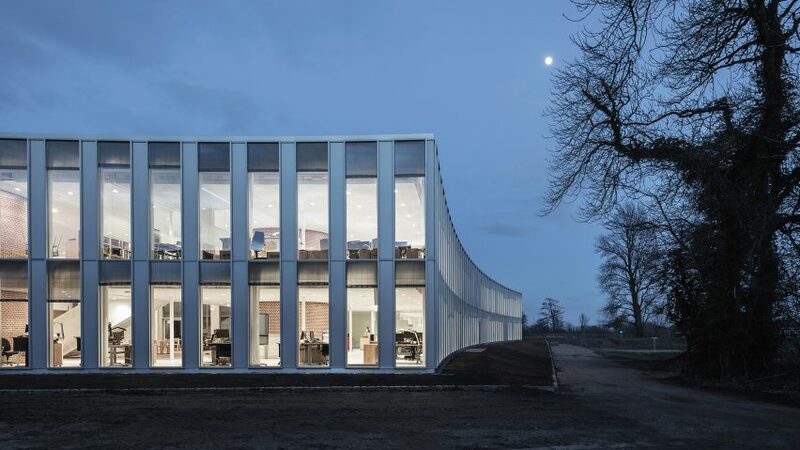 Scooped glass wings form this extension designed by Danish studio Sleth for a postmodern town hall in Tønder, southern Denmark. 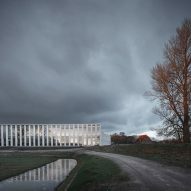 Sleth won a competition to extend and renovate Tønder Townhall, which was originally designed by Danish modernist Jakob Halldor Gunnløgsson. Completed in 1981, the patterned brick building is considered locally to be of postmodern style. 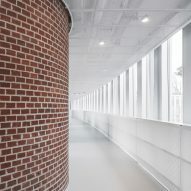 The 3,000-square-metre extension intentionally contrasts the linear brick building with its bright white colouring and concave facades – a reference to the curve of a nearby river. 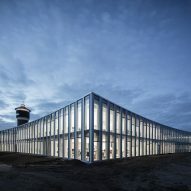 Long strips of glazing set vertically into white frames face out into the marsh landscape of the site. The four-sided wing angles away from either end of the existing building to enclose a 1,100-square-metre courtyard between the old and new parts of the structure. "The concept for the proposal is a dialogue between the brutality and heaviness of the original building, and lightness and delicacy of the new building," said the architects. "The project is not creating two competing buildings, but two parts of the whole that works together and supplement each other." 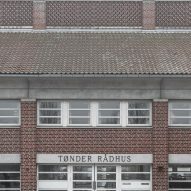 "The extension of the original Tønder town hall is based upon the juxtaposition of the historical town hall – a classical public office building with corridors and offices, reception and a central arrival hall – and an addition that brings in something new, a distinctly open and transparent public house," they added. Red brick was used to pave the inner courtyard and ground floor of the extension, referencing the construction of the building it is affixed to. Inside, the a layout designed to be non-hierarchical provides socialising space for employees. Sleth has offices in Aarhus and Copenhagen. 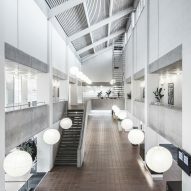 The firm's previous projects include an office block in Aarhus with a cracked concrete facade and external staircase. Photography is by Rasmus Hjortshøj of Coast.